High Priest chronicles 16 psychedelic trips taken in the days before LSD was made illegal. The trip guides or "high priests" include Aldous Huxley, Gordon Wasson, William S. Burroughs, Godsdog, Allen Ginsberg, Ram Dass, Ralph Metzner, Willy (a junkie from New York City), Huston Smith, Frank Barron and others. The scene was millbrook, a mansion in upstate New York that was the mecca of psychedelia during the 1960's, and of the many luminaries of the period who made a pilgrimage there to trip with Leary and his group, The League for Spritual Discovery. Each chapter includes an i-ching reading, a chronicle of what happened during the trip, marginalia of comments and quotations, and illustrations. 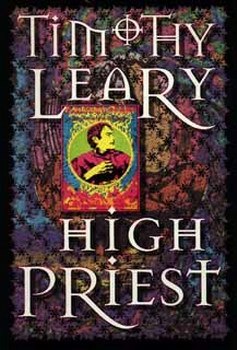 A fascinating window into an era, this first new edition of high priest in over 25 years includes a foreword by Allen Ginsberg, a new introduction by Timothy Leary about the intergenerational counterculture, and new illustrations by Howard Hallis. Timothy Leary, the visionary Harvard psychologist who became a guru of the 60's counterculture, has reemerged as an icon of the new edge cyberpunks. "Dr. Leary is a hero of american consciousness. He began as a sophisticated academician, he encountered discoveries in his field which confounded him and ... he pursued his studies ... beyond the boundaries of public knowledge." "A true visionary of the potential of the human mind and spirit." "The counterculture shaman of the hippie generation."